This book came at the right time and changed my life. I didn’t expect it. I thought this was going to be a cute romance book about a hippy-ish woman meeting an uptight lawyer, and you know the rest. And it was. Thankfully, it was much, much more than that. Much more. Stay with me here. The original teaching character of this book, the female protagonist, begins the journey by reflecting on the Dalai Lama’s teaching of religion being on a horizontal axis and awakening on a vertical axis. No matter your place in your own religion, you can become deeper in both its understanding and understanding in general. She says, people “stuck Jesus on a horizontal plane and turned him into a religion instead of a savior.” And, “Christianity hasn’t failed us; we just haven’t tried it yet.” Along the journey of this book there are other teachers representing Islam and Buddhism; these other teachers help represent other custom or creed religions. It is fascinating, thought-provoking, and, as mentioned before, life changing. As a story, it is straight forward. Funny at times, but predictable—I kept turning the pages! This book was a slower, studious read for me, because I wanted to pause and ponder. The author included footnotes with external references and further reading. I’m already reading one those recommended books. 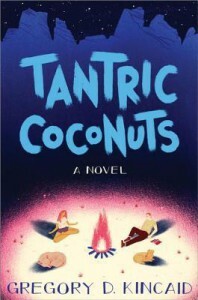 Since reading TANTRIC COCONUTS, I’ve already noticed a difference in my personal religious walk. My understanding of my faith has increased, as well as my appreciation of service. No, I didn’t expect it to come from a commercially published—what I expected to be—rom com, but boy, did I walk away impressed.